Elevator equipment consists of a large number of precision components; the components of a common elevator are as many as 20,000 pieces. Long-term operation of the elevator may cause various components wear and aging, and thus decrease the operation performance, gradually. For this purpose, no matter how good quality the equipment is, if normal check and professional maintenance are not performed well, the life of the elevator will be shortened greatly. As it can be seen from the figure below, professional maintenance of the elevator will maintain the mechanism in the best status. In addition, the overhaul time, number of working times of repairing and maintenance can be controlled within the minimum limit, and greatly prolong the service life of the elevator. According to the Regulations on Safety Supervision of Special Equipment, the elevator shall be maintained at least once every 15 days. According to the Special Equipment Safety Law of the People's Republic of China, maintenance of the elevator shall be carried out by the elevator manufacturer or a maintenance unit entrusted by it. The service support system for elevators is the special service of Hitachi for original elevators. 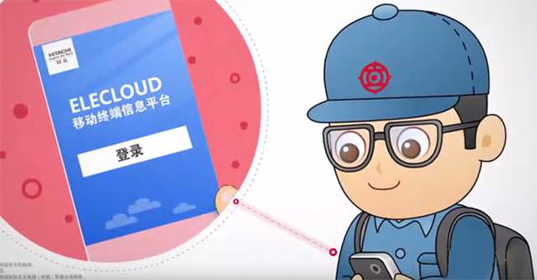 By the standard configured remote monitor terminal on the elevator, the service system transmits the elevator's operation data to Hitachi large data center, ELECLOUD®,in real time, which will analyze and make diagnosis automatically based on the collected data of the elevator. This truly achieves remote monitoring of the elevator. At present, we have provided remote monitoring services of over 150,000 Hitachi elevators. ELECLOUD®mobile terminal information platform takes the mobile terminal (PDA) as the carrier to provide convenient elevator repair and maintenance services. In case of failure of the elevator, the remote monitoring center will find the nearest maintenance engineer by PDA positioning, and call the engineer for troubleshooting at site. In addition, ELECLOUD® mobile terminal information platform is also a troubleshooting tool and assists the onsite engineer to debug the elevator, feeds back the troubleshooting result back to each level of Hitachi remote monitoring center, so as to make sure the handling process and result are properly controlled and establishes quick communication channel between the onsite engineer and the headquarter backstage support platform. 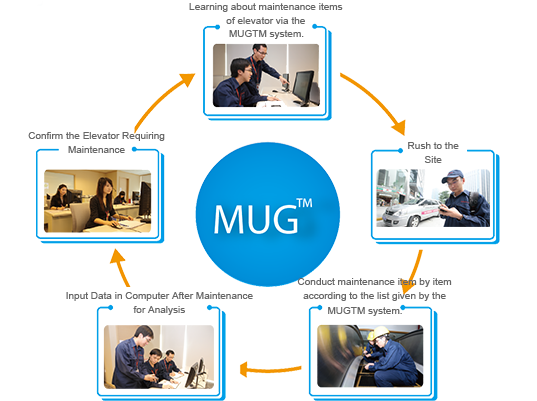 MUG®maintenance and management system customizes exclusive maintenance items and maintenance plans for customers according to the elevator use environment, operation efficiency, components life, seasonal changes, and so on, to achieve a refined management of the maintenance service. 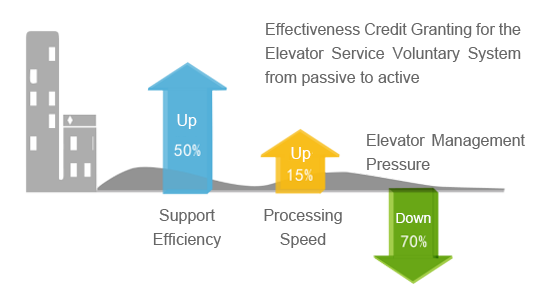 The system can provide differentiated service, customize individualized plan based on the demands of customers, manage the full life circle maintenance service of the elevator through working sheet and filing management to make sure the elevator maintenance has high efficiency and high quality.